Qualimark with its in-depth industry expertise designed and developed Automatic Chapati Making Machine with new innovative designing approach. It designed entire machine from scratch and made it with superior grade material. It is very much compaq in size hence uses very less space compared to other chapati making machines. It uses precision motor, gearbox and rotary indexing mechanism and conveyor system which can deliver high production rate. It has better insulation and other heating components. It comes in two variants; round and conveyer type model. With enriched industrial acquaintance, we are providing a varied series of Chapati Machine. Owing to their top performance and heat resistance, these are enormously demanded. Keeping in mind ever-evolving requirements of our respected clients, we are offering a premium quality range of Chapati Making Machine. We have manufactured fully Automatic Chapati Making Machine for our customers by our team of expert technicians. 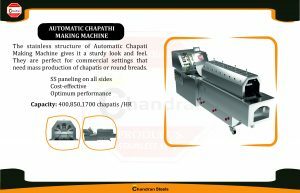 The machine produces Chapattis in most hygienic way. This machine has a rotary tool for cutting roti in different sizes. This machine has an automatic temperature control. We offer these machines in lots of designs. Established in the year 2000, we “CHANDRAN STEELS” are a notable and prominent Sole Proprietorship firm that is engaged in manufacturing a wide range of Chapati Making System, Kitchen Equipment, Tandoor Charcoal System, etc. Located in COIMBATORE(TAMILNADU, India), we are supported by a well functional infrastructural unit that assists us in the manufacturing of a wide range of products as per the set industry norms. Under the headship of our mentor “Mr.Shivanesan”, we have gained a remarkable and strong position in the market.